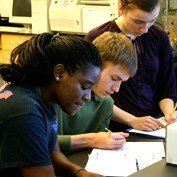 The health professions seminar is the capstone course of the health professions track. Through classroom discussion, readings and conversations with health professionals, students gain an understanding of career options. The seminar gives a clear idea of what the different available professions involve, examines ethical issues that health professionals must grapple with, and prepares students for application to medical school or other health professions schools. The seminar's assigned journal entries and weekly discussions of medical ethics build a close bond between students and faculty. The professor's knowledge of student's interests, concerns and strengths creates an ideal situation for mentoring and advising during the medical school application process. "In leading the health professions seminar, I consider it a privilege to help students develop realistic goals and career direction through the course. I strive to direct students to the most up-to-date information and study preparation resources and to provide good general advice about medical school. I regularly attend meetings of the National and New England Associations of Advisors for the Health Professions to keep up on the latest changes and developments in the field. The best part of the course is probably the invited guest; over the course of two years, the students meet about 24 different health professionals who I invite to share their stories and advice. Seeing our students successfully enter health professions careers is a highly rewarding part of my job as a Gordon professor."